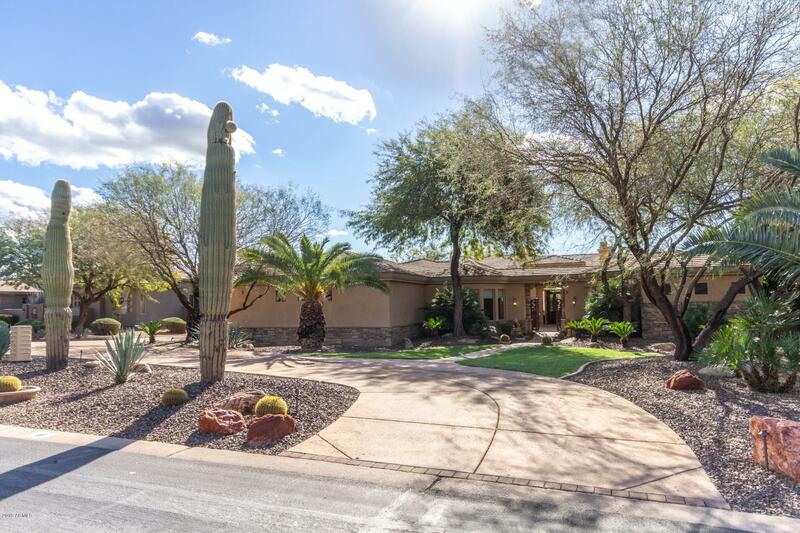 All CACTUS GATES homes currently listed for sale in Scottsdale as of 04/26/2019 are shown below. You can change the search criteria at any time by pressing the 'Change Search' button below. "Spacious split plan with many upgrades including full remodeled kitchen with induction stove top and entertaining area, travertine flooring, wine and beverage refrigerator station, plantation shutters and premier glass/iron Cantera Doors opening to allow for indoor/outdoor entertaining. Walk in pantry and beautifully quartz slab countertops in kitchen and granite on bar. Open and bright floor plan, focusses on the incredible Resort Style back yard, Mountain views, pot/rock waterfall, multiple fl"
"This cul-da-sac oasis has a great open floor plan and an entertainers dream back yard. Every bedroom has it's own en-suite bath allowing for comfortable family or vacation living. Soaring ceiling heights throughout this meticulously cared for home. The yard is home to a heated pool, jacuzzi, fire pit and a large grassy area for endless days/nights of enjoying the Arizona weather. The master has beautiful natural light, a generous walk in closet, rain shower and tub. 3 car garage is home to a wo"